Many toys from Okinawa carry a name given in the local dialect. July 1936 : The Okinawa Folk Museum opened in the Shuri Castle Hokuden building, under the auspices of the Okinawa School Teachers’ Association. Utchiri Kubusaa ウッチリクブサー "Roly-poly Daruma Doll".
. koi nori dooji 鯉乗り童子 child riding a carp . 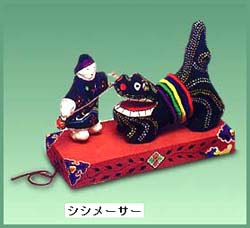 One of Ryukyu's famous toys, the 'hariko', known as the bringer of good luck, is sold at the toy bazaar held on the day of the Yukkanuhi (the fourth day of the fifth month on the lunar calendar). 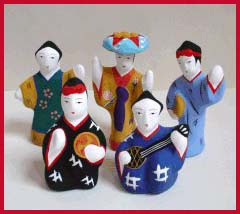 The skills for crafting the hariko were brought here from Japan after the 17th century. 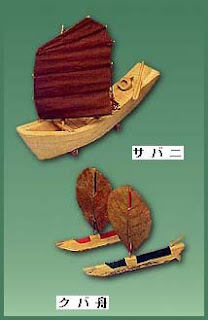 The original target for the hariko were children from upper-class families. By the Meiji period, though, the hariko had become a popular and affordable toy for the average child. Okinawan hariko were influenced by the Ryukyu Kingdom, continental China, and by their own inland cultures. These multiple influences fused in the distinctive shapes and rich colors of the hariko. 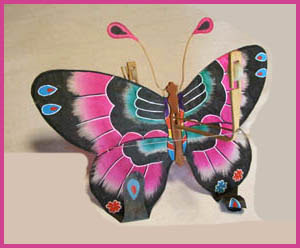 Other Ryukyu toys, such as pinwheels made from the leaf of Adan, puppets made from the nut of the Sago palm, and butterfly-shaped kites also show the same subtle charm combined with various influences. Over the times, plastic and tin toys replaced the popularity of the Ryukyu toys, though each toy still shows expression and tender warmness and is appreciated by many people.
. ryuukyuu garasu 琉球硝子 Ryukyu glassware . adan is a tropical tree growing in many parts of Okinawa. The root is used to produce fibers. Its little open mouth can be used to catch a finger. The wooden horse is mounted on a box with wheels. It resembles the cart of the King of the Ryukyu empire. When the cart is moved, a device inside brings some strings to produce a sound - pinpin -. At the same time, the horse moves its head. It is a kind of karakuri gangu からくり玩具 mechanical toy.
. haarii sen 爬龍船 ハーりーせん . made from a plant called fuuchoosoo 風蝶草. Cleome gynandra is considered an invasive weed in many places in the U.S. and elsewhere in the Pacific. Originating in India, this method of weaving was introduced into Japan around the 14th century along eastern trade routes. It is also said that Kumejima Tsumugi started when someone taught the islanders how to weave after studying sericulture techniques in China. Kumejima is therefore considered to be the birthplace of Japanese pongee. From the beginning of the Edo period (1600-1868) until the second half of the Meiji era (1868-1912), pongee was collected in lieu of taxes. As the color of the cloth is subdued, a kimono can be worn for two or three generations, regardless of the age of its wearer, if a different obi is worn. A light, summer-weight cloth is now also being produced. The very dark shade of brown is obtained by using plant dyestuffs and mud. This makes the skin of the wearer appear paler and the reeled yarn contributes significantly to giving this cloth a suppleness that so gracefully wraps the body of its wearer. 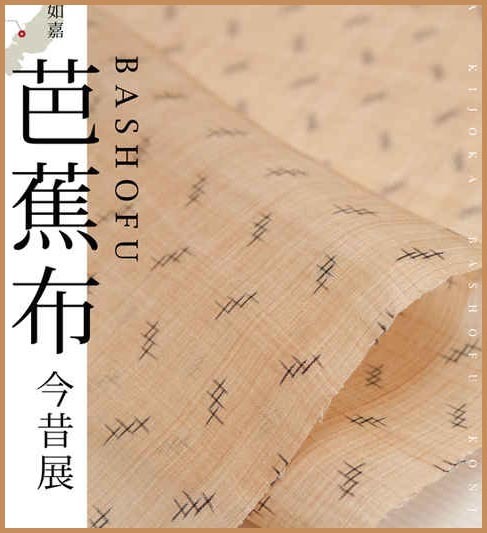 The traditions of this cloth, which is still being made for kimono and obi as well as for tablecloths, curtains and other household accessories. 1. Produced in Nakasatoson (Kume Island) Shimajirigun, Okinawa Prefecture.
. tsumugi 紬 pongee, silk weaving, silk fabric . 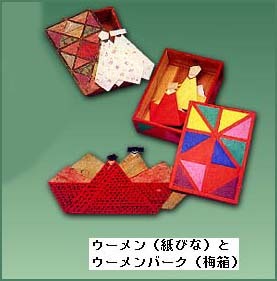 The shape and painting of this kite is geometrical pattern which we cannot find anywhere in Japan. There were no specialist makers in Okinawa and people made their kites themselves. The Mattaku has four corners. The frame is made in a geometrical pattern. On Hateruma Island, this harvest festival is celebrated during Obon. It features a parade of the local fertility god Miruku and his children (the local children), shishi ("lion") dances, and staff dances. ©　More in the WIKIPEDIA - Yaeyama Islands! a festival that occurs during the Obon period in Okinawa. Designated a National Important Intangible Folk Cultural Property, and held on July 14th of the lunar calendar, the Mushaama Festival combines Obon festivities with harvest festival ceremonies like the Miruku fertility deity parade. On this special day, islanders offer prayers to their ancestors and pray for their happiness, bountiful crops and big catch.
. Miyako joofu 宮古上布 Miyako Jofu ramie hemp cloth . Like the chinchin horse, this is a mechanical toy which makes a sound. The lion opens and shuts its big red mouth. 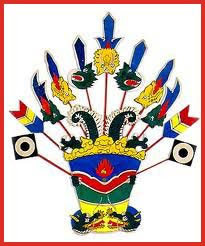 The body is wrapped in a sash of five auspicious colors, for good luck. awamori 泡盛【激レア】闘牛 liquor clled "fighting bulls"
The dolls are kept in the paper box. 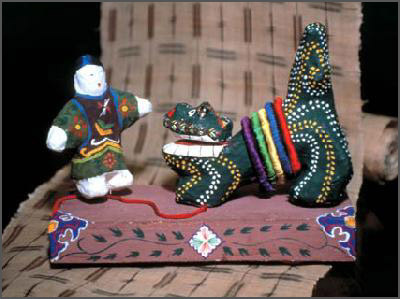 The dolls are made, one folded from white paper, like the ritual hitogata 人形 figures for purification, and the other from colored paper to make a pair. There are records confirming that a cotton cloth or minsaa which had originated in Afghanistan and had been brought to the Ryukyus from China was in use at the beginning of the 16th century at the Ryukyu court. It seems fairly certain, therefore, that minsaa was already being woven in the Yaeyama area about this time. The name minsaa is derived from min meaning cotton and saa meaning narrow band. In the past, a woman would give a minsaa to a man she loved, the four or five patterns woven into the cloth being a sign of unfailing affection. 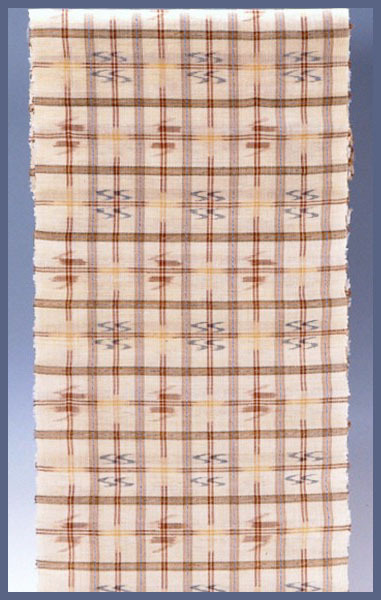 Both warp and weft threads are cotton and the ikat threads are tied by hand. The dyestuff is usually indigo producing a sea-blue like background on which the pattern is picked out in white in beautiful contrast. 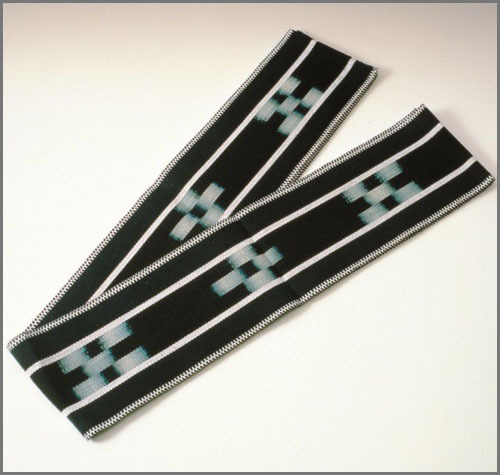 The main products are obi sashes for men and women and ties. Satsuma was one of the old provinces occupying what is now the western part of Kagoshima Prefecture at the southern end of Kyushu. 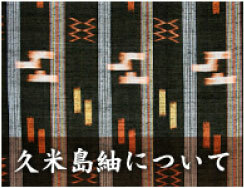 Forces from Satsuma invaded Ryukyu in 1609 and the compulsory weaving of Yaeyama Jofu to pay a poll tax that was levied, in turn led to an improvement of techniques. After the tax was abolished in 1907, a union was set up and the weaving of this cloth prospered as an industry. Weaving ceased for a time due to World War II but was revived gradually after the conflict was over. the yarn is a hand spun ramie, or china grass. Being a hand-woven cloth, there are slight differences in color and pattern and no two pieces are the same. It has a light touch making it an ideal cloth for a summer kimono. 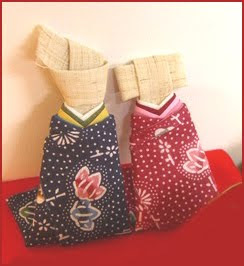 The main products are kimono fabrics, obi sashes, wall hangings etc.
. joofu 上布 Jofu ramie hemp cloth from Japan . A pair of male-female dragons is facing each other at the bottom. The main part is made from paper with five corners, to hold the weapons. It was a present when a baby boy was born and decorated on the fourth of the fifth lunar month. This adorable little village is comprised of a series of small houses, kilns and shops that sprawl over a small hill in Yomitan, just north of Kadena Air Base. ... There are about 45 practicing potters and glass artists who work in this little district. 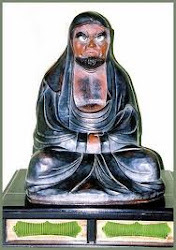 The Ryukyuan religion is the indigenous belief system of the Ryukyu Islands. The noro or nūru priestesses are the oldest kaminchu in the Ryukyu Islands. They communicate with, make offerings to, and, at times, channel ancestors, local gods and more powerful deities. Their primary duty is to officiate at communitywide (that is, "official") festivals and rituals. ... According to George Kerr in his Okinawa: the History of an Island People, the noro was at one time a priestess-queen, wielding both political and spiritual power within her community.
. Reference and Photos : Isamu Folk Toys .
. Okinawa Folk Toys - this BLOG .